Ever since Silent Night, Bloody Night, it seems like there are more horror movies set during Christmas than Halloween. While there is something appealingly subversive about some Killer Kringles, the exploitation of a holy day remains less than edifying. Finally, eleven filmmakers (two working in tandem) put horror in its proper season—Halloween. By the way, that is seventeen days from today. All sorts of malevolent monsters and men come creeping out in the multi-director anthology film, Tales of Halloween (trailer here), which opens this Friday in select theaters. Adrienne Barbeau will guide us through the assorted stories and give us warm nostalgic feelings as the voice of the radio DJ working Halloween night. When she warns us this town goes nuts on Halloween, she is not kidding. The film starts with Dave Parker’s Sweet Tooth as a candy-themed warmed up. It is a pretty traditional bogey man-is-more-real-than-the-stupid-teenagers-using-him-to-scare-a-naïve-kid sort of story, but like many of the constituent tales, Parker’s execution is strong. Frankly, The Night Billy Raised Hell might be Saw franchise veteran Darren Lynn Bousman’s best work to date. Again, a young trick-or-treater is led astray by older siblings. Peer pressured into pranking their rarely seen neighbor, Billy discovers the hard way he is a rather Mephistophelean gent. Alas, the lad is whisked off into a bacchanal of mischief and violence that will definitely leave a mark. Seriously, you have never seen Barry Bostwick this evil before, but it is worth the wait. Adam Gierasch’s Trick easily boasts the most sinister twist of the entire film. It starts out reminiscent of Bruce McDonald’s Hellions, with its Hellspawn trick-or-treaters, until it isn’t. It’s the sort of story that depends on the reveal, but Gierasch totally pulls it off. Finally, the bullies start to get their comeuppance in Paul Solet’s The Weak and the Wicked. Grace Phipps and her two sociopathic running mates have tormented their meek victim well past reason—until tonight. Cue the gruesome transformation effects. Again, this tale is relatively conventional, but Solet gives it a distinctly creepy vibe. Perhaps the weakest link, Grim Grinning Ghost, comes from the film’s conceptual organizer, Axelle Carolyn. When a Halloween party guest is so freaked out by her host’s story, she bolts for home, where she will be completely alone and vulnerable. We pretty much know what will happen beat-by-beat, but at least fan favorite Lin Shaye gets to tell the spooky yarn. In a twist, it is the trick-or-treaters that are in jeopardy in Lucky McKee’s Hansel & Gretel riff, Ding Dong. Let’s just say an unstable middle aged woman without children is a little too eager for Halloween each year. It is not the best in show, but it is certainly a weird little bauble. Andrew Kasch & John Skipp’s This Mean War is a mere trifle about rival neighbors and their Halloween decorations. However, things really heat up with Mike Mendez’s Friday the 31st. What starts out as an homage to old school slasher movies quickly goes totally nuts. There will be Claymation and delirious gore. It is a total treat. The same is true of Ryan Schifrin’s The Ransom of Rusty Rex. Yes, as a transparent horror take on O. Henry, we know exactly where this is going, but Schifrin (son of Lalo, who scored the film) keeps the energy and attitude cranked way the heck up. The voice of John Landis gleefully declining their ransom demands is the icing on the cake. Neil Marshall ends Halloween strong with Bad Seed, a sort of “Attack of the Killer Pumpkins” story that is considerably moodier and far less campy than it sounds. It also features the highest density of cult movie cameos, with Joe Dante getting the most screen time. Anthologies are always uneven, but since it all happens in the same put-upon town on Halloween night, the constituent tales mostly share a consistent look. Frankly, the score card is pretty good: four really strong tales and maybe three or four that are mixed bags, but still have something interesting to offer. 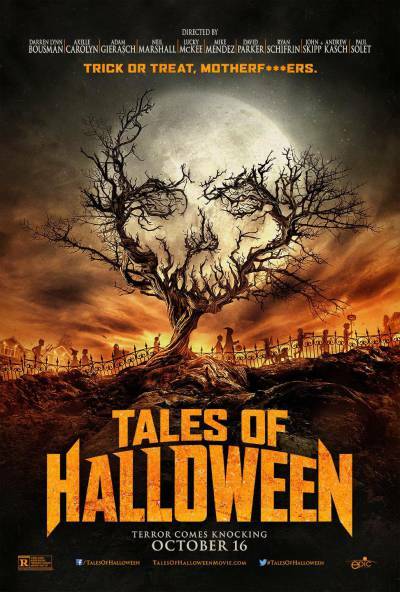 Recommended for horror fans, especially those who follow the assorted filmmakers and cast-members, Tales of Halloween opens this Friday (10/16) in select cities, including the Littleton Alamo Drafthouse in Colorado.